WEST LAFAYETTE, Ind. — A new process for storing and generating hydrogen to run fuel cells in cars has been invented by chemical engineers at Purdue University. 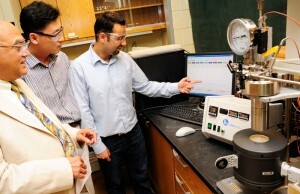 “The key is how to efficiently release the hydrogen from this compound, and that is what we have discovered,” he said. The research has been funded by the U.S. Department of Energy by a grant through the Energy Center in Purdue’s Discovery Park. “The recycling isn’t important for small-scale applications, such as portable electronics, but is needed before the process becomes practical for cars,” Varma said. If they can commercialize this technology it will make compressed hydrogen for vehicles obsolete.